The Netflix screen on my tv asking if I am still watching. I have been binge watching Homeland while editing this week. What do you do when you’re not galavanting around the world? I am originally from Monopoli, a beach town in the South of Italy, where I lived until moving to Australia in 2012. I left home with no real plan as I just wanted to escape the boring small town routine and see more of this world. Life has taken an unexpected turn and I am now settled here in Melbourne and run my own photography business. I grew up loving all things visual, art and movies. As a teen, I would spend a crazy amount of money on magazines to cover the walls and doors of my room with photos. I eventually received my first DSLR for my 18th birthday and started replacing those with my own travel photographs. After moving to Melbourne, I wanted to focus on something I was passionate about and photography was the first thing that came to mind, so I got myself a new lens and started shooting again and now it’s all I do. Social media has played a big part in this process. I find getting constantly bombarded with all this amazing content from talented people doing what they love is empowering. If someone else can do it, I can too. Naturally you always have your camera - what other essentials do carry when travelling? Good tunes, itineraries, and snacks. Lots of electronic music, mixed with some rap and movie soundtracks I love. Favourite artist these past few weeks has been 6Lack. All three. Road tripping around in a van is awesome but so is sleeping in a comfy bed and have a nice shower after a full day of hiking taking photos. Was there anything about Ireland that took you by surprise? It’s so green and the landscape is ever changing. I didn’t do much research before visiting so my expectations on the beauty of this country were definitely exceeded. 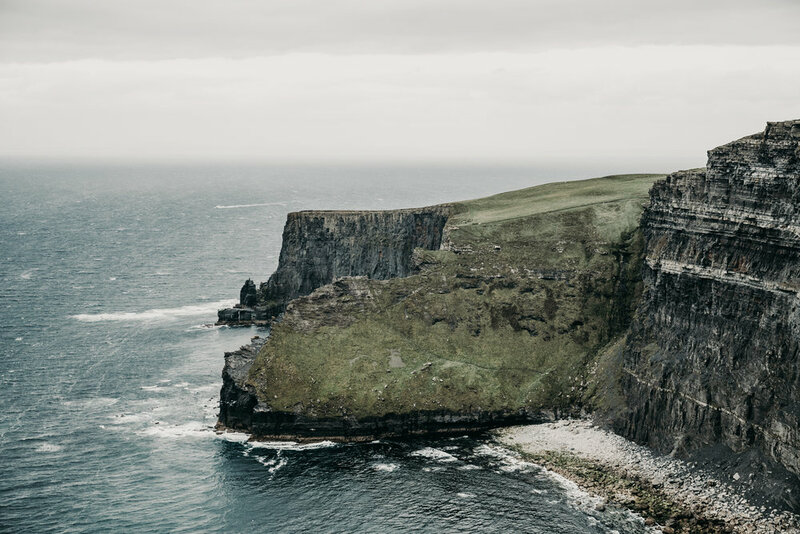 Where in particular did you travel whilst in Ireland? We flew into Dublin where we spent a couple of days wandering around the city before adventuring down the South Coast. We road tripped from Cork around the Ring of Kerry, stopping in Portmagee so we could reach Skellig Michael (my favourite) by boat and then back on the road all the way to Galway passing through the Burren National Park, the famous Cliffs of Moher and the surfing town of Lahinch. What did you like about Ireland? Visiting the country with a local definitely made all the difference. One of my Irish friends offered to show us around and I loved hearing about the history and folklore stories of all the towns we visited. The highlight for me was definitely visiting Skellig Michael as I never experience such a dramatic landscape before. By the time we reached the first island by boat, home for over 70,000 birds, the sun started picking through the clouds making everything a bit more magical. Photos really don’t do this place justice. Just do it. Don’t wait for the right time or others. Revaluate your priorities. I have the longest bucket list, so this year I am planning to visit a different place every month, starting in March when I’ll be heading on a road trip around the North Island of NZ for a couple of weeks. I love the Ocean but mountains have been looking pretty attractive right now so I am heading to Northern Europe with one of my friends during Aussie Spring. I am also hoping to see more of Australia, go back to Japan and the USA, and maybe visit some tropical destinations for the first time. Ary continues to inspire us with her incredible photography and passion for travel and adventure. You can find Ary on Instagram here. Check out her website and blog here.